Why not enhance your upgrade even further with the use of our handmade braided hoses and specially formulated Roadrace brake fluid? 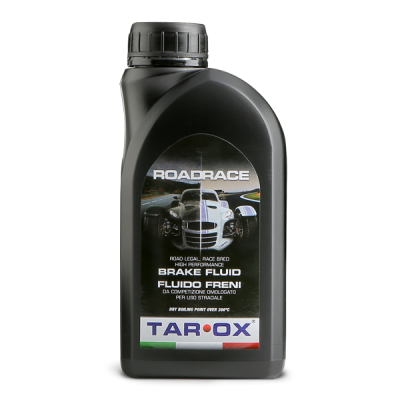 TAROX RoadRace meets and exceeds the current DOT 4 specification, which covers a huge range of brake fluids with widely differing properties. DOT 4 brake fluid boiling points, for example, will range from a minimum of 230°C to over 300°C like TAROX RoadRace. DOT 5.1 fluids are not designed to have particularly high boiling points – around 270°C being typical. Their main advantage is improved low-temperature viscosity which is only relevant in very cold climates where vehicles are using ESP systems. This means that they are fluids designed for road use rather than track use. 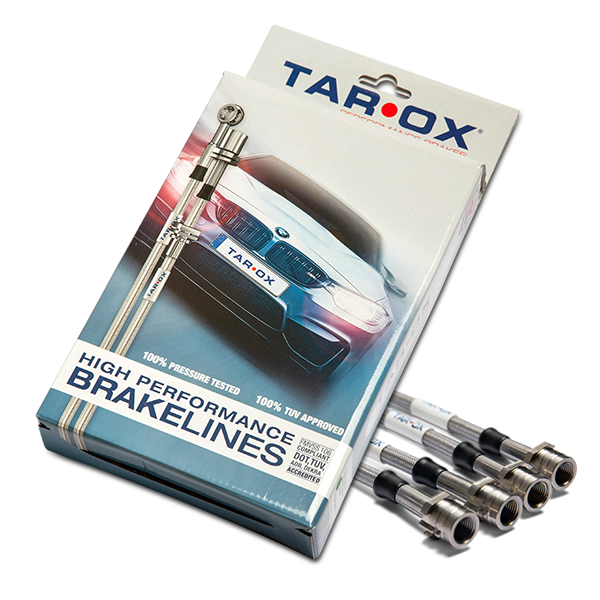 TAROX RoadRace is a much better track/road compromise than a DOT 5.1 – boiling point being a far bigger problem on the track, than low temperature viscosity is on the roads. 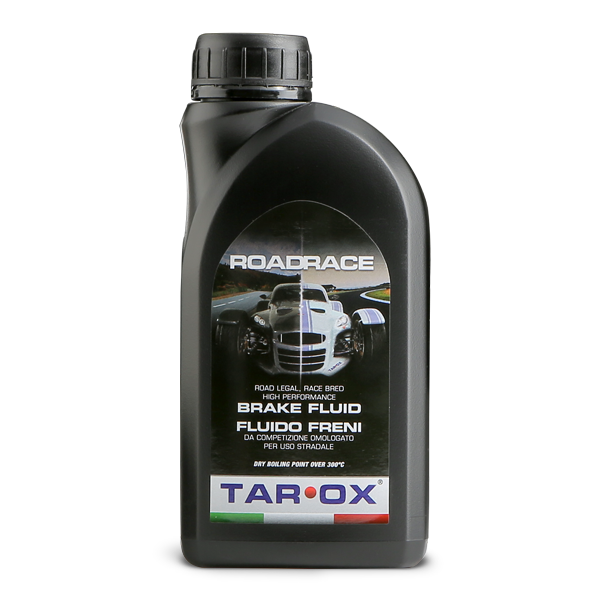 TAROX RoadRace brake fluid is road legal in the United States and Canada because it meets the requirements of the FMVSS 116 DOT 4 standard. It is also legal for road use in Spain because it meets the requirements of the UNE 26-109-88. The USA, Canada and Spain are almost unique in specifying minimum performance requirements for brake fluids that are to be used on public roads. Most other countries take the view that the product must be fit for the purpose, which is demonstrated by conformance to the main brake fluid standards. Most vehicle manufacturers in Europe recommend brake fluids that conform to DOT 4. When TAROX RoadRace brake fluid is being used on the road, it is advised to keep following manufacturers’ recommended change times and obtain the benefit of the extra safety margin provided. For best results, bleed the system with fresh fluid before each race, especially if the brakes are excessively hot and/or the conditions are humid. Do not mix with other brake fluids. Firstly, it cannot be used for those vehicles requiring a mineral based fluid (LHM). Secondly, it is not recommended for older classic cars produced before 1970. Even here in almost all cases the product can be used perfectly satisfactorily but a very few older cars (especially in the United States) used seals which can perform poorly with high-performance fluid such as TAROX RoadRace. A high boiling DOT 3 fluid is usually more appropriate in these cases. 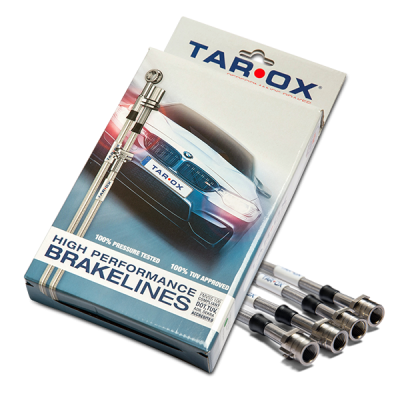 Treat your brake system to a complete overhaul with TAROX discs, pads, braided hoses and Roadrace fluid, to truly unlock your car's stopping potential.